Bus from Klang to Seremban is the only transportation option in connecting people between the two cities. Many locals rely on the service to travel between the cities for work and school. Why Taking Bus from Klang to Seremban? 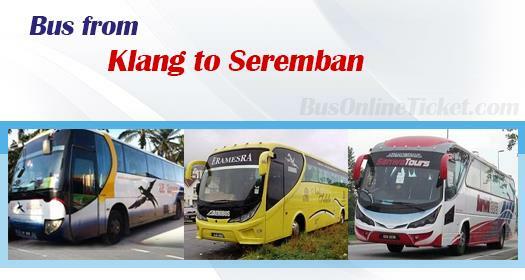 The main reason for Klang passengers' preference to take bus from Klang to Seremban is because of the convenient Klang boarding point as compared to taking bus from KL to Seremban. Residents in Klang saves their time from travelling to KL by boarding at Klang Sentral Terminal. Besides the boarding point, the frequent bus schedule from Klang to Seremban offers more flexible travelling time for passengers. SE Super Express, D Amour, and Sanwa Express are few bus operators offering bus from Klang to Seremban. Their combined trips have total up to 9 daily departures. Their first bus service starts as early as 9:00am. The following schedules are 10:00am, 12:00pm, 1:30pm, 2:00pm, 6:30pm, 8:30pm, 10:00pm and 10:30pm. The bus fare from Klang to Seremban is charged in a range of RM 9.40 to RM 15.00, depending on your selection of bus operators and coach types. D Amour offers budget bus fare at RM 9.40 by deploying standard 40 seater coach. As for SE Super and Sanwa, they charge a small premium on bus fare at RM 10.00 - RM 15.00 by deploying VIP coach. The duration for bus from Klang to Seremban takes about 1.5 hours, depending on the traffic condition. The boarding point in Klang is conveniently located at Klang Sentral Bus Terminal. The bus service to Seremban from Klang will terminate at Seremban Bus Terminal One. Even though there are frequent schedules for bus from Klang to Seremban, one should not always think to purchase ticket last minute at counter. We advised you to book your bus ticket online through the most reliable online ticketing portal BusOnlineTicket.com. We accept payment made by credit cards, debit cards, internet banking, Alipay or pay by cash at any 7-Eleven outlets in Klang Valley for best convenience.